Have you ever thought about working as Retail Assistant at a retailer in the UK? 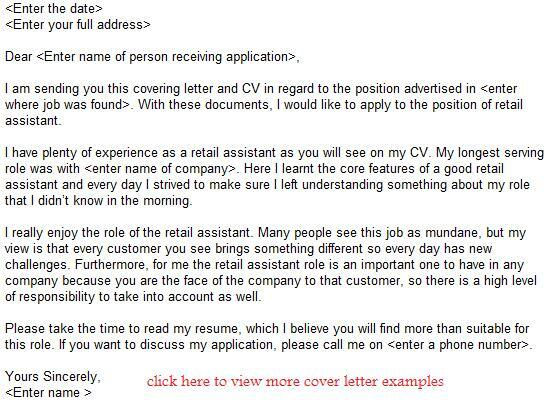 If you did and now want to learn about how to write Retail Assistant job application letter then check out following example. There are thousands of retail and sales assistant job vacancies on the job sites online and if you want to apply for one of them then check out the retail assistant job application letter sample and write your own one. You can use the sample letter just after editing the company and job details and add your contact information including your address, telephone number and emails so they can reach you whenever they want to. Here is Retail Assistant Covering Letter Example!